Do you enjoy copycat recipes? I love to try and recreate some of my favorite foods from restaurants that I enjoy. Starbuck’s is a favorite of many for their delicious coffees, but their food is also pretty tasty. The recipe for a Copycat Starbucks Lemon Loaf is fresh and super tasty and a pretty good approximation of the original. My husband’s favorite desserts feature lemons. He is not overly fond of super sweet recipes, so the tangy tartness of a lemon really appeals to him in a sweet treat. 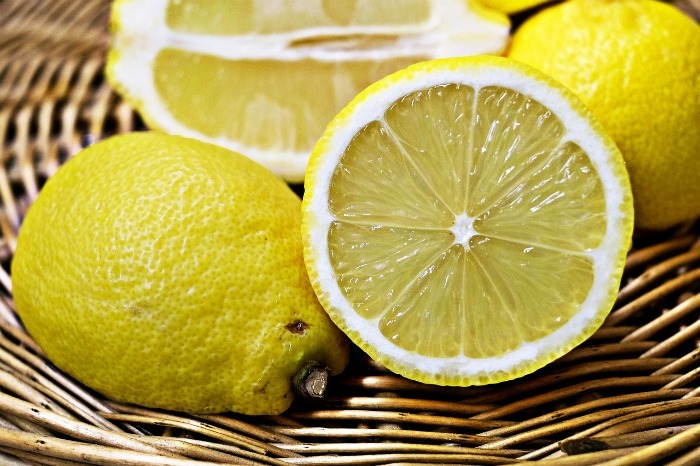 If you enjoy using lemons too, be cure to check out my Gluten free lemon slice recipe. It’s amazing! 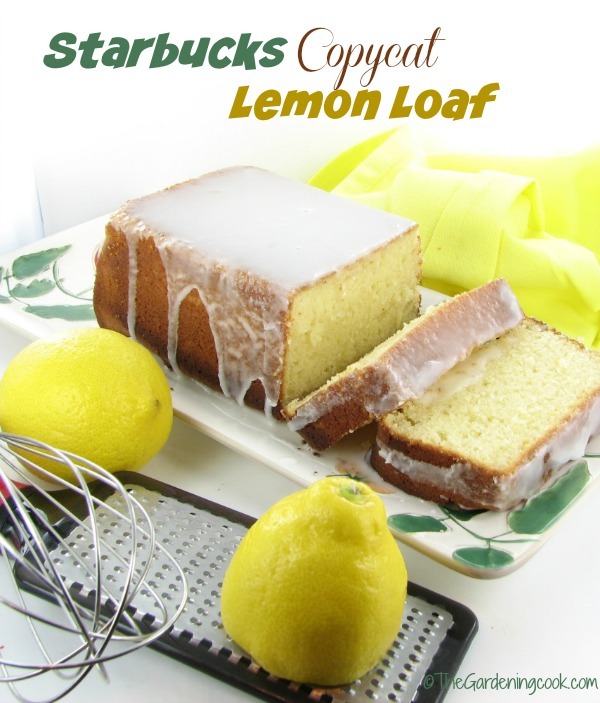 Treat Yourself to Starbucks Lemon Loaf – Copycat style. I also love the taste of fresh lemons in desserts. They are bright and tart and bring a lovely taste to any home made dessert particularly if you also use the zest which has lots of flavor in it. 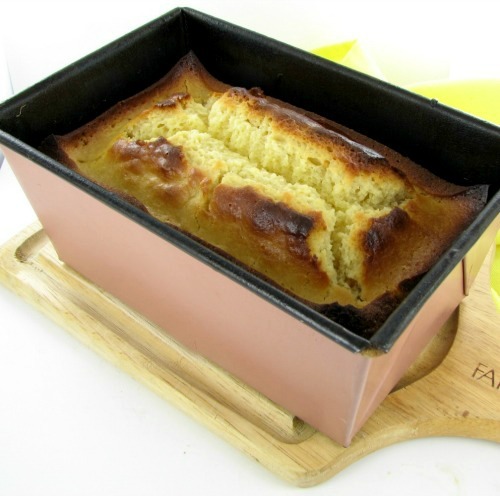 Good copycat recipes are hard to find but this one for Starbucks lemon loaf will make you think you are dining out instead of at your kitchen table. The mixture will seem thin to you when you put it in the loaf pan. Don’t worry, it will turn out fine. This was mine half way through cooking. I always turn my foods half way through to make sure they brown evenly. (old oven!) 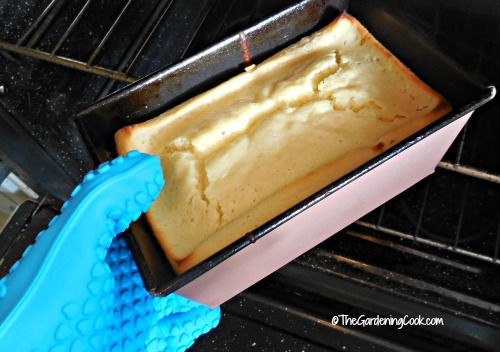 This recipe gave me a chance to try out my new silicone oven mitts. I adore them. I reached right in and grabbed that pan and there was not a hint of heat through them! The loaf will rise during cooking. You can either glaze it with the raised top, or do what I did, and slice off just a bit of the raised area and flip it over to make a flat top for glazing. Either way is fine though. 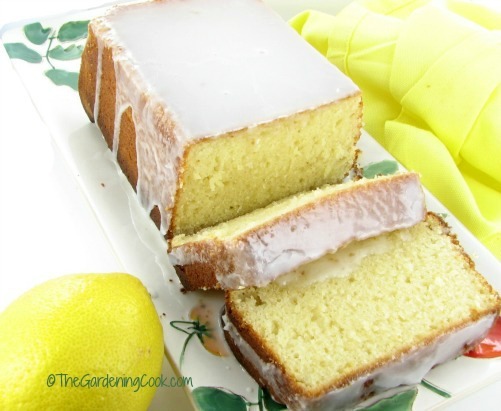 The lemon loaf is easy to make. Be sure to add the glaze when it is still a little warm to give it the desired look. This really is a very tasty cake. It is rich and fresh with a great lemon taste but not too sweet. My whole family loved it! I received the oven mitts pictured above from SimPrium for an honest review of the product. I found that they fit well, were not too bulky to use and really protected my hands from the heat in my oven. If you love lemon desserts, these lemon cheesecakes with an animal cracker crust is another great recipe to try. Preheat your oven to 350°F. Grease and flour a 9 x 5 loaf pan. Parchment paper inside will also help to release the cake when it is done, if you like. In a large bowl sift together flour, baking soda, baking powder and salt and set aside. In the bowl of a stand mixer combine the wet ingredients: eggs, sugar, butter, vanilla extract, lemon extract and lemon juice and mix until well combine. Add oil and lemon zest and mix well. Pour the dry ingredients into the wet ingredients and stir until smooth. Pour into mixture into a loaf pan and bake for 45 minutes until toothpick inserted in the center comes out clean about 55-60 minutes. Remove from oven and then cool in pan on a rack. Whisk the glaze ingredients to combine and pour over the cooled loaf. I made this cake today, exactly as written. I didn’t suffer any issues with the cake falling, it came out perfectly. The recipe called for oil but didn’t specify a particular type of oil, so I used coconut oil. I don’t know if this had any bearing on the end result, but I honestly can’t complain about this recipe. Glad to read this.i have made this 3 times the last 2 times it has fallen!!!! Grr!!! Not pretty for a gift!!! I’ve made other “copy cat recipes” for the Starbucks Lemon Loaf, and the loaf always falls after coming out of the oven. After reading Tara’s review to reduce the soda and baking powder to 1/4 teaspoon each, I made this recipe and it came out perfect! It did not fall a bit. The bottom and sides were a bit crusty but I think that was due to using a glass baking dish, which I will change next time. Lemon loafs are good all year long, and always a great addition to holiday baking! For some reason it would not let me rate the recipe, but I give it 5 stars. Thanks Paul Glad it worked out for you. I made this today using 1/4 tsp.EACH of the baking powder and baking soda, based upon reviews of fallen loaves. Also replaced the oil with unsweetened applesauce (I do this often in baked goods). I omitted the vanilla and used fresh squeezed lemon juice (vs. prepared lemon juice). I live in Colorado and baked this for 42 minutes at 350 degrees and it’s perfect. I would even add another tsp. of lemon extract to the batter. So good! Thank you for sharing and all of the other helpful comments!